And that is the end of this live page. Thank you so much for all your comments. Hope you all enjoyed it as much as we did. What a night it has been for Mark Allen. He has achieved a dream of his by winning one of snooker's majors with a 10-7 victory over Kyren Wilson. Mark Allen beat Kyren Wilson 10-7 to become the first Northern Irishman to win the Masters since Dennis Taylor in 1987. The final at the Alexandra Palace was a tight affair until the 11th frame, when Allen, 31, made a 73 break to move 6-5 ahead before adding 119 in the next. Englishman Wilson, the world number 14, went another frame behind before rallying to pull it back to 8-7. Allen responded with breaks of 69 and 71 to take the £200,000 first prize. Allen to parade trophy at Windsor Park? Masters champion Mark Allen tells Eurosport: "I am so lucky to play the game I love for a living. I miss my family when I am away but this trophy makes it easier. I am not getting carried away, this is hopefully the first title of many. I feel like I am one of the top players and never proved it and this can be the start. I believe in my ability. But I need to be winning these events. "My dad has put so much in to my game over the years and it is the first time he has seen me win a tournament like this. He is the nicest guy you will meet. My mates were all there. I can hear their voices because they are so distinct. It settles me down to see them, because I played in front of them for years. "There was a fan zone set up in my home town so it is nice to finally win something for them. We are a tight-knit community. I'd like to parade this trophy around Windsor Park (where Northern Ireland's football team plays) for the green and white army." Toby James Ingram: Fantastic final! Mark Allen big congrats, I hope you can win the Crucible next!! Kyran Wilson is a future champion. Mark my words! David Holcroft‏: Now that is what snooker is all about. A cauldron of emotion. Brilliant. Here is the winning moment again. Truly now Mark Allen is a Premiership player. He played the classier snooker all week, under pressure. He is very liked on the tour. The crowd warm to him, they know he is genuine. Kyren has played with his heart on his sleeve. It is no crime to lose. He has had a wonderful week and he will be back for more. Here is some reaction from the snooker world, with tweets from Ken Doherty, Mike Dunn and Joe Perry. BBC Sport app users may need to click on the links to see the tweets. I'm thrilled for Mark Allen to win it. He has been a class act for so many years. It is a wonderful feeling and all the hours of practice are all worth it. Kyren Wilson has had a fantastic week and he gave everything. He was ultimately beaten by the better man. It has been a wonderful competition. It has been great to watch. I am going to go and shake Mark's hand as I couldn't be happier for him. Masters champion Mark Allen says: "It is surreal, it has been a long time coming, I was never sure it would come, I have knocked on the door for so long. "What a competitor Kyren Wilson is, not just a competitor, he is the nicest guy you can meet and he will have many more days like this. I know what it is like to lose a major, I was in that seat for the UK Championship (in 2011), losing to Judd Trump and Kyren will be in finals for years to come. "I felt calm all week, apart from the first session today, as the match went on I got stronger. I'm just pleased to be on the right end of it for once. Someone told me it is 40 years since Alex Higgins won so to bring it back to Northern Ireland is what I wanted. Hopefully this is a step to bigger things, hopefully there are more triple crown (titles) to come." Allen also praises World Snooker chairman Barry Hearn and says: "We have not always seen eye to eye, but Bazza is doing a wonderful job of promoting our sport, it has been full here every day. Well done." I've had an incredible week. I said to my coach if anyone was going to beat me I would love it to be Mark. He has been knocking on the door. He deserves it. It is all too much for Kyren Wilson. It was the biggest match of his career and he is in tears. No heroics from Mark, as he rolls in a red and made certain of the black. It is a big, big moment in Mark Allen's career. 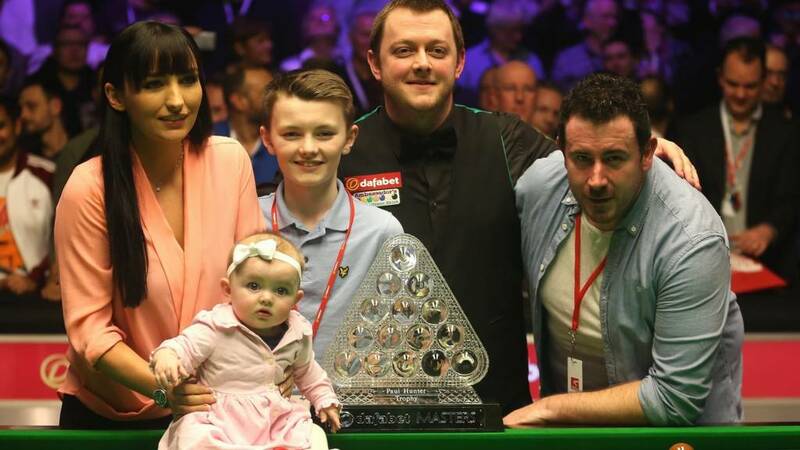 It was 40 years since Alex Higgins won the title and now another Northern Irish player has done it. Spare a thought for Kyren Wilson, but Mark Allen is the Masters champion. A break of 72 gives Mark Allen the title. Kyren Wilson comes to congratulate him. Allen punches the air, he has done it. The biggest win of his career. And the black. Wilson needs a miracle. And another red. Wilson needs snookers. This really is a fantastic chance for Allen to close out the championship. He is looking good. He would love to win it in one visit. The finish line is in sight for Allen. Allen is up to 36. Kyren Wilson sits, waits and hopes for another chance.